Newborn babies with brain damage could be treated by stem cell therapy using cells taken from their bone marrow. Researchers told the BA Festival of Science they successfully transplanted human foetal cells from bone marrow into the brains of newborn mice. Dr Huseiyn Mehmet of Imperial College hopes to use the technique to replace dead tissue in the brains of babies. He said they could also be cooled, as this seemed to delay the natural cell death that follows brain injury. 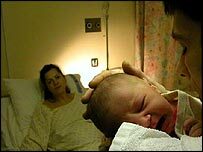 There are several causes of brain damage in newborn babies. Babies born at term can have the blood supply to their brain broken off, called hypoxia, when the umbilical cord becomes wrapped around their necks. This can result in debilitating injury to the brain. A national study has also shown that babies born before 30 weeks have an 80% chance of some form of neurological deficit. The researchers, led by Dr Mehmet, showed that human foetal stem cells could integrate into the brains of mouse foetuses which are still in the wombs of their mothers. Transplantation of foetal stem cells could be combined with cooling therapy, which seems to slow down the advancing process of cell death following brain injury. "The idea would be that when babies were born you would cool them, saving many of the cells," Dr Mehmet said. "By reducing the body temperature by 3C over 12 hours, we get a substantial improvement in animal trials and now initial clinical trials. "Later on you could take out some of the bone marrow, tweak it so you trigger some differentiation in the brain cells' lineages - not all the way, of course. "Then depending on what that individual's deficit is you can then transplant some of the stem cell lineages into the brain." Foetal stem cells are the equivalent of adult stem cells except that they are taken from the newborn. They differ from the embryonic stem cells which can form all the cells in the body of an organism. When tissue is damaged, cells around the damaged area start to die through a natural process of attrition called apoptosis. This occurs because the dead cells in the damaged area no longer provide them with the survival signals they require to survive. Cooling could be effective in slowing down this process.